High Alzheimer's Rates Among African-Americans May Be Tied To Poverty : Shots - Health News New research finds that African-Americans who grow up in harsh environments and have many stressful experiences are much more likely to develop Alzheimer's or some other form of dementia. New research finds that African-Americans who grow up in harsh environments and endure stressful experiences are much more likely to develop Alzheimer's or some other form of dementia. The findings could help explain why African-Americans are twice as likely as white Americans to develop dementia. And the research suggests genetic factors are not a major contributor. "The increased risk seems to be a matter of experience rather than ancestry," says Megan Zuelsdorff, a postdoctoral fellow in the Health Disparities Research Scholars Program at the University of Wisconsin-Madison. Scientists have struggled to understand why African-Americans are so likely to develop dementia. They are more likely to have conditions like high blood pressure and diabetes, which can affect the brain. 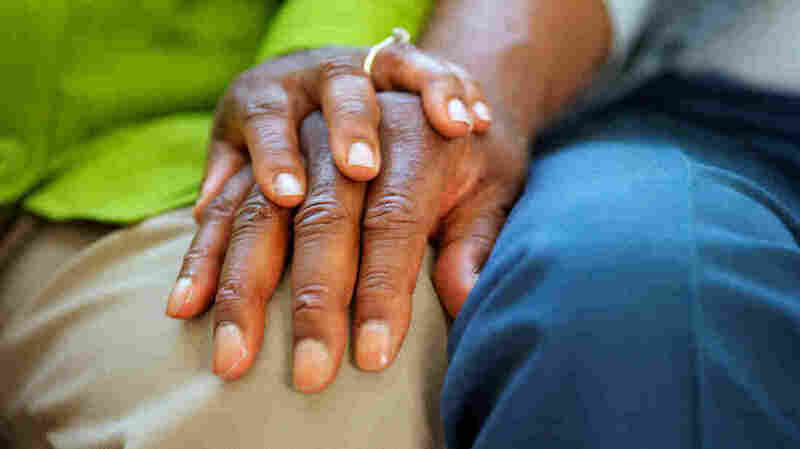 And previous research has found some evidence that African-Americans are more likely to carry genes that raise the risk. But more recent studies suggest those explanations are incomplete, says Rachel Whitmer, an epidemiologist with Kaiser Permanente's Division of Research in Northern California. Whitmer has been involved in several studies that accounted for genetic and disease risks when comparing dementia in white and black Americans. "And we still saw these [racial] differences," she says. "So there is still something there that we are trying to get at." The research presented at the Alzheimer's conference suggests the missing factors involve adverse life experiences beginning in childhood. These experiences have already been linked to a range of diseases, including heart disease and cancer. "We're starting to understand how early life stress and early life deprivation can increase your risk of a number of health outcomes in late life," Whitmer says. "And the latest thing is understanding how and why that might affect the brain." Whitmer was part of a team that presented results of a study of more than 6,000 Kaiser Permanente health plan members, most born in the 1920s. The team wanted to know whether people who grew up in harsher conditions were more likely to develop dementia. So they looked at people who'd been born in states with high infant mortality rates — an indicator of social problems like poverty and limited access to medical care. White people's risk of dementia wasn't affected by their place of birth. But black people were 40 percent more likely to develop dementia if they'd been born in a state with high infant mortality. "These people left the state and subsequently moved to northern California, yet there was still this very robust association between being born in a state with high infant mortality and increased risk of dementia," Whitmer says. Scientists from the University of Wisconsin presented results of a study of the link between stressful life events and mental function in middle age. They studied more than 1,300 people in their 50s and 60s, including 82 African-Americans. Stressful experiences included having a parent with a drinking problem, financial insecurity, legal issues, divorce, being fired from a job, and the death of a child. African-Americans reported 60 percent more of these stressful events than white Americans. But that was only part of the difference, Zuelsdorff says. "The impact of these stressful events was stronger in African-Americans than it was in non-Hispanic white participants," she says. The researchers discovered this by administering tests that reveal the brain's speed and flexibility in doing certain tasks. These abilities normally decline with age. So the team looked for evidence that stressful events were accelerating this decline. And they found that in white participants, each stressful event added about a year and a half to normal brain aging. But in African-Americans, each event aged the brain an extra four years. The next challenge for researchers is to figure out precisely how adverse life experiences are changing the brain, Zuelsdorff says. That will mean looking at the effects of stress hormones and seeing whether stress leads to inflammation in the brain, something that has been associated with Alzheimer's.